This is an elevated look at downtown Carson City, seen from the roof of the building at Carson and Spear streets. Looking southeast, you can see several blocks of the downtown area, along with a lot of traffic on Carson Street. At this time there were no medians on Carson Street, and parallel parking along the curbs. 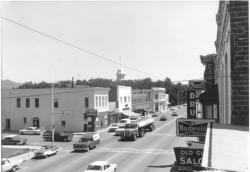 The prominent building on the left is the Kitzmeyer Furniture Building. 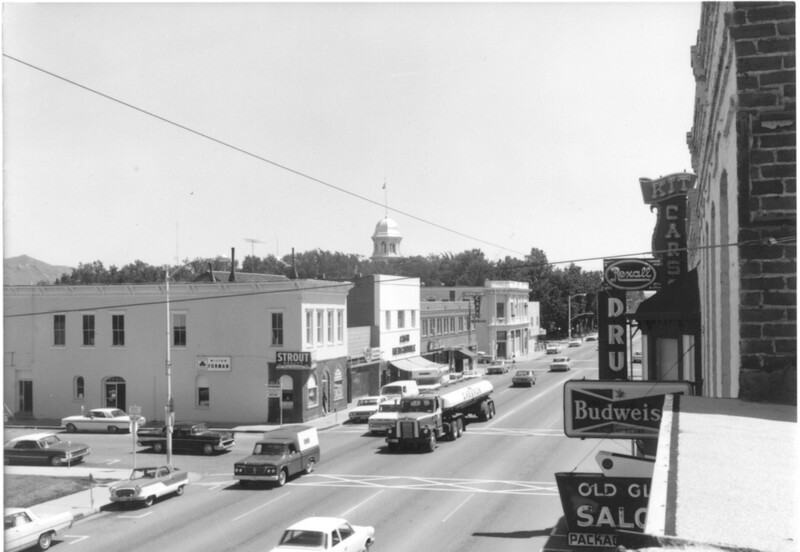 It is home to Strout Realty, and the Milton Forman State Farm insurance agency. The white facade to the right is the Cash Mercantile, and beyond that is the Sweetland Building. At the close end of the Sweetland is a place called Wilbur's, and at the far end is the Pine Cone Cafe, which was in that spot for a couple of decades. And past that, on the opposite side of Proctor Street, is the Bullion and Exchange Bank Building and the Senator Cafe. That whole block has since been torn down. On the far right of the picture is a cluster of signs for the businesses that were located at the northwest corner of Carson and Telegraph. Visible are signs for the Old Globe Saloon, Rexall Drug, and the Kit Carson Club. The Capitol dome rises above everything, sticking out of a sea of trees.